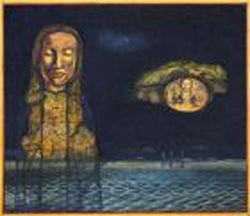 Born in Calcutta, West Bengal 1984 Member, Society of Contemporary Artists, Calcutta. ? Lives and works in Kolkata. 1977 Graduated from the Govt. College of Art and Craft, Calcutta. Lalit Kala Akademi, New Delhi. ? National Gallery of Modern Art, New Delhi. ? Rupankar Museum, Bharat Bhavan, Bhopal. ? Birla Academy of Art and Culture, Kolkata. ? Tata Iron and Steel Company. ? Birla Group of Industries. ? Karnataka Chitrakala Parishath, Bangalore. ? Sanghi Industries, Hyderabad. ? Bengal Foundation, Dhaka. ? RPG Enterprises, Mumbai. ? Goodricke Group Limited, Kolkata. ? Delhi Art Gallery, New Delhi. 1986 National Award, Lalit Kala Akademi, New Delhi. ? 1986 State Govt. Award, Calcutta. ? 1998 Senior fellowship in the field of Visual Art, Ministry of Human Resource Development, Govt. of India. ? Honoured by South Zone Cultural Centre, Hyderabad. `In the history of modernism in Bengal, and indeed India, Aditya Basak is counted amongst the most successful artists of the younger crop. More importantly, despite continuing to adhere to some of the bastions of Bengali modernism, Basak, today just past fifty, is among the few who strive to traverse the bridge between modernist idioms and post-modern art practice. 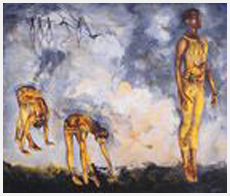 A staunch believer in the fact that neither art nor the artist can remain frozen in time, Basak views his entire creative enterprise as a journey through human history and evolution.....A master in the true pictorial and poetic tradition of the Bengal school, drawing from the practiced picture-making elements and visual styles of the 50s and 60s, Basak today practices not only painting, but also video. His preoccupation continues to be the progression/regression of human civilizations and the role that history plays in their evolution. As time progresses and points of vision are transposed, identities alter and emerge afresh.